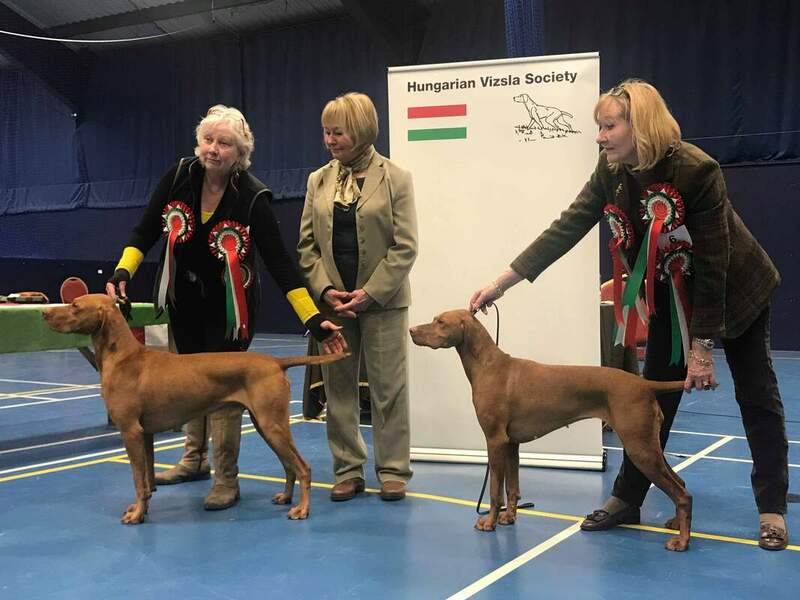 The Hungarian Vizsla Society held a spring pointing test on Saturday 13th April, 2019 at Brandon. The Judges were Trevor Rigby and Paul Nixon. The only dog graded on the day was HVS Member Deb Brown's Sigourney Maverick whose grading was "Good". ​Photo of smiling faces shown below. From left to right - Our ground host Malcolm Partridge, Senior A Panel Judge Trevor Rigby, Handler Deb Browns with GSP Dog Sigourney Maverick, and Judge Paul Nixon. Hope the competitors enjoyed their day. Top Vizslas at the Championship Show with Judge Penny Williams. click here for photos of class winners. To be held on Sunday 24th February 2019, at Moulsoe Millennium Village Hall, Cranfield Rd, Moulsoe Newport Pagnell MK16 0HB - commencing at 2.15pm prompt. We are offering at the Annual General Meeting, three www.vizsla.org.uk tables made up of one breed specialist with four guests on a first come first served basis. The format will be 25 minutes with your breed specialist and your three colleagues to ask any question whatsoever which is Vizsla specific. It will be limited to four people so that it becomes an intimate and precious moment, where hopefully you will learn something that you will treasure for many years to come. and Breed Education Coordinator (BEC) Christine Ryan who will talk about “A Century of Breed Type”. Between them they have issued many sets of Challenge Certificates and have over 100 years of experience with the Vizsla. There is no cost to this - absolutely free for something that money couldn't buy. If you get to the AGM at least 40 minutes before it starts, and you happen to be one of the first dozen people there, you will be able to share their expert knowledge in an intimate way and not in a large classroom situation. We will even have beverages and cake available to you for your one-to-one with your breed specialist. Why don't you ask them about that moment in time when their Vizsla mentor shared knowledge with them and what it was? The stopwatch will beep at the end of 20 minutes and we will quickly go towards the start of the Annual General Meeting itself. If that is an opportunity that you would like to take up - you need to be at the AGM at least 35 minutes before the start of the meeting (scheduled for 2pm). ​We look forward to seeing those that want to take up the offer. It could be a "Precious Moment" for years to come. Verity Griffiths has kindly written regarding this awful disease, it can be found HERE. Membership is not just for people who show and/or work their Vizslas - it is for owners who care about the breed and for prospective owners who are interested in the breed. We aim to protect the future of this wonderful breed and provide organisational safeguarding. We need your membership in order to continue doing this. If there were no breed clubs, none of this would be possible. You may not have the time to help us, but just by being a member of the Hungarian Vizsla Society, you are supporting the breed that we all love so much.